Looking for a practical, step-by-step guide to creating a documentary film? You might look no further than a new compact handbook co-authored by UC Santa Cruz associate professor of film and digital media Gustavo Vazquez with John Hewitt, San Francisco State professor emeritus of broadcast and electronic communication arts. 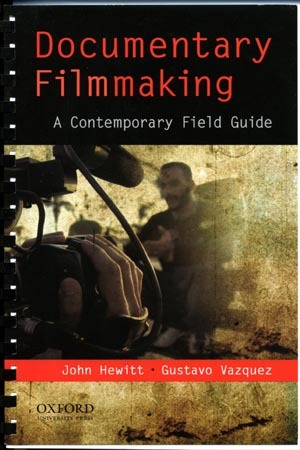 Titled Documentary Filmmaking: A Contemporary Field Guide, the book is a straightforward, hands-on workbook that follows the documentary production path all the way from idea to distribution. Although there are numerous books about documentary filmmaking already out there on the market, Vazquez is confident that his book will stand out. "The current crop of books doesn't explore the process the way we do," said Vazquez. "The others try to accomplish too much-adding historical or theoretical chapters. Ours is street smart." Designed for both seasoned practitioners and students, the book offers sound advice on everything from the crucial role of story construction, to the importance of staying on top of emerging distribution methods. "Whether you are a penniless, guerilla documentary hopeful wanting to distribute on Internet video and mobile phone screens, a student expecting to make it to Sundance, or a recognized documentary producer with an exclusive PBS contract for the next 16 years, we hope you find this book useful and revealing." Documentary Filmmaking: A Contemporary Field Guide is designed to alert potential filmmakers to the most successful methods-as well as the pitfalls-of each stage in making a documentary film. It arose out of the two authors' combined 60 years of independent documentary work and 40 years of teaching experience. Vazquez, who specializes in video production as a professor at UC Santa Cruz, has been making independent films for the past three decades. His most recent documentary, Que viva La Lucha, explores social class and border culture through the world of Mexican masked wrestling. It had its premiere in 2007 at the Mill Valley Film Festival. Vazquez's other films include El Zocalo (co-produced with UCSC film professor and Ant Farm collective founder Chip Lord); Corazon de Seda (Heart of Silk), a biographical documentary on the composer Agustin Lara; Comedy of the Underground, a portrait of San Francisco experimental filmmaker George Kuchar; and The Great Mojado Invasion-which Vazquez described as "a classic Chicano sci-fi cult film that continues to be politically relevant to the global anti-immigrant hysteria." Hewitt has spent the past four decades working as an independent documentary producer, cinematographer, and editor. His works include Landmines of the Heart, a look at political reconciliation in Cambodia; Smokestack Lightnin': The Music of Howlin' Wolf; A Passion for Horses, Staying Lost and Found in Bahia; and The Summer of the Amigos. Hewitt was also director of photography for America's Chemical Angels (2007), which explored drug therapy for children with ADHD. He specialized in documentary production, broadcast journalism, and international broadcast systems as a professor at San Francisco State University. Documentary Filmmaking: A Contemporary Field Guide is available at Oxford University Press, (800) 445-9714, www.oup.com.